Nominations open on 27th February 2014 and close at 5pm on 5th March 2014. Election of Part-time Officers: Thursday 13th March 2014 *The Students’ Union Council Chairperson will be elected at the last SU Council meeting of the academic year on Monday 3rd March 2014 at 6pm. Only registered Class Reps are eligible to vote in this election. what’s it all about? The Students’ Union is an independent body whose function is to represent its members and promote, defend and vindicate their rights in the University and elsewhere. Every student, on payment of the student levy, is automatically a member of the Students’ Union. As a result you are entitled to avail of all the Union’s services. Those services range from advice on welfare and education to the Students’ Union Shop and the College Bar. In addition to those services, the Union represents you on all university committees. We work with the university to ensure your voice is heard and that any concerns you have are raised. We advise, lobby and speak on your behalf from orientation through to graduation. The Students’ Union Executive Committee runs the Union on an on-going basis and is responsible for the day to day representational functions and activities of the Union. The Executive is made up of fifteen officers who are nominated and elected each year by you, the members. The Executive are responsible for providing you with information and advice covering the whole spectrum of student life from academic issues to issues regarding accommodation and equality. What do they do? The responsibilities of each officer is outlined in the Students’ Union Constitution. The President i. S/He shall act as Chairperson and shall have responsibility to uphold this Constitution and the terms of reference of all Union companies. ii. S/He shall be responsible for liaising with the appropriate staff members of the Union, the Union’s companies and with University management. iii. S/He shall have responsibility for the day to day finances of the Union in conjunction with the senior staff member and shall report to the Finance Committee on those issues. iv. S/He shall also be responsible for ultimate coordination of Students’ Union campaigns v. S/He shall be required to act as a member of the Boards of Directors of companies owned by or related to the Union. vi. S/He will represent Union members on University committees. vii. S/He shall be the Chief Executive Officer and chief spokesperson of the Union. viii. S/He shall be the principal delegate to the National Council and Annual Congress of the Union of Students in Ireland. The President co-ordinates the activities of the Students’ Union and works with University Management to achieve the best academic environment and quality of life for NUI Galway students. The President is responsible for the Union’s finances, co-ordination of Union campaigns and acts as the chief spokesperson of the Union. The President sits on a wide range of university committees including Údarás na hOllscoile, Finance Resource Committee and Standing & Strategic Planning Committee. The President is also a director of several companies: • Students’ Union Commercial Services Ltd: A company owned by the Students’ Union which manages the College Bar, Students’ Union Shop, Smokey’s Café, The Hub Café, The Wall Café and Caife na Gaeilge. The President is Chairperson of this board. • Seirbhísí Comhaltas na Mac Léinn Teo : A company owned by the Students’ Union responsible for producing Students’ Union publications. • College Campus Radio Ltd: A company responsible for Flirt FM • Cumann Céimithe na Gaillimhe Aonad Sláinte do Mhic Léinn Teo: A company responsible for managing the Student Health Unit. ix. S/He shall also be required to give a mandatory report on work carried out at each Executive meeting. What do they do? Vice President Welfare Officer i. S/He shall have responsibility for providing information and educating the general student body on welfare issues and to this end shall initiate campaigns on relevant and pressing Welfare issues. The Welfare Officer assists students with problems in areas of accommodation, childcare, study, health, finances and social welfare. He / She works closely with on-campus accommodation companies and residents associations. He / She sits on a wide range of university committees including Safety Committee, Discipline Committee and the University Centre Planning & Management Group. iii. S/He shall represent members on various University committees. The Welfare Officer also organises the Welfare Forum and a variety of high profile campaigns such as Mental Health Week and SHAG Week. Dealing with individual student queries is a large part of the Welfare Officer’s job. iv. S/He shall also organise and chair the Welfare Forum. v. S/He shall also be required to give a mandatory report on work carried out at each Executive meeting. What do they do? Vice President / Education Officer i. S/He shall have ultimate responsibility for the co-ordination of the CRC in conjunction with the relevant staff members. ii. S/He shall provide a confidential listening and referral service for all Union members. iii. S/He shall represent members on various University committees. iv. S/He also has responsibility for keeping the Executive and general student body informed on relevant educational issues. v. S/He shall be responsible for dealing with individual requests from students. vi. S/He shall also organise and chair the Education Forum. vii. S/He shall also be required to give a mandatory report on work carried out at each Executive meeting. What do they do? The Equality Officer i. S/He shall have responsibility for the promotion of equal opportunities and equal participation for all members of the Union. ii. S/He shall initiate relevant campaigns to highlight and address difficulties facing students arising from societal and / or campus inequalities. iii. S/He shall be responsible for promoting integration in all student activities iv. S/He shall provide a limited number of hours weekly for the purposes of consultation and referral for Union members. The Mature Students Officer i. S/He shall represent mature students on campus. ii. S/He shall promote their full involvement in the academic and social life of the university community. iii. S/He shall work with the other Studentsâ&#x20AC;&#x2122; Union officers, clubs, societies and the University as a whole to promote the development and integration of mature students at NUI Galway. v. S/He will represent Union members on various University committees. i. S/He shall be responsible for the promotion of the Irish language and culture amongst the members of the Union. ii. S/He shall enforce the policy set out in Article 18.B. i. S/He shall be responsible for developing Union policy on postgraduate education. iii. S/He shall support the work of the Irish language societies on campus. iv. S/He shall work primarily in conjunction with the Vice-President / Education Officer. iv. S/He shall be proficient in Irish. The Elections Committee may, before an election, demand an Irish Language Officer candidate to demonstrate his/her fluency and literacy in Irish. The Director of Spoken Irish in NUI Galway (or a person nominated by the Director) shall adjudicate. A lack in fluency or literacy shall deem that candidate ineligible for the position. v. S/He will represent Union members on various University committees. iii. S/He shall promote their full involvement in the academic and social life of the university community and the University. What do they do? The Societies’ Chairperson i. S/He shall have the responsibility of liaising between the University’s societies, the Union, and the University. ii. S/He shall also help and advise societies and voice their concerns and needs on relevant University Committees. iii. As such, the Union recognises the Societies’ Chairperson as the Chief Representative of the University’s societies. iv. S/He shall also organise and chair the Societies’ Forum. Students’ Union Council Chairperson, i. S/He shall chair the meetings of the Students’ Union Council ii. S/He shall represent all class representatives on the Executive Committee. iii. He/she shall work with the College Convenors to see that each class in the University has a class representative. College Convenors i. They shall act as the chairpersons of each relevant College Class Representatives Council (‘College Council’). i. S  /He shall have the responsibility of liaising between the University’s clubs, the i. Union, and the University. ii. They shall represent their College’s class representatives and students at the Executive Committee. ii. S/He shall also help and advise clubs and voice their concerns and needs on relevant University Committees. iii. They shall work with the Chairperson of Students’ Union Council to see that each class in the University has a class representative. iii. As such, the Union recognises the Clubs’ Captain as the Chief Representative of the University’s clubs. iv. S/He shall also organise and chair the Clubs’ Forum. The Students’ Union has a huge impact on the lives of students. Whether it’s fighting for longer library hours over Easter so that you can complete that all important dissertation, or being part of a national campaign for student rights – as a Students’ Union Officer you have the ability to greatly affect the lives of students. Being involved in the management of an organisation with over 16,000 members before you leave college puts you in a great position. You will develop skills in leadership and organisation and learn about finances, democracy, education, event management and a whole host of other skills. From negotiating agreements with the University to giving presentations to thousands of students; from leading campaigns to create positive change, to working as part of a team of leaders; these are skills which will help you out in the incredibly tough job-market and make you stand out from the crowd. The roles are really what you make of them; if you are elected you get the chance to make the role your own. You will help fight for thousands of students One of your most important roles will be to represent students. From diverse issues such as learning & teaching, to students being treated as equal citizens in the community, you will ensure that the student voice is heard loud and clear. You will be a leader of a unique organisation As a Student Leader you will be one of the fifteen people responsible for leading the Students’ Union. You will have the opportunity to shape the direction and work of an organisation in a way you may never have again. Complete with professional staff to support you, you have a great opportunity to make some big changes. No matter which role you go for, you’ll gain experience of chairing meetings, leading campaigns, managing budgets, communicating and team building. How Do You Run? Eligibility  Are you a registered student and have you paid the student levy? If you can answer yes (and chances are you can) then that’s it. You’re eligible to seek nomination. Choosing a Position The first thing you need to decide is whether you want to run for a full-time or part-time position. A full time position means you’ll have to take a year out from your studies if you’re not due to finish this summer. However, part-time positions are flexible and can fit around your studies. Secondly, take a look at each role and the full job description. All positions offer varied responsibilities and experience. Think about the skills you might have that would make you a good candidate for a position. Talk to the current officers about their experiences in the role and what they’ve experienced. Nominating yourself To nominate yourself, you must complete a nomination form with the details and signatures of at least 20 members of the Students’ Union. Nomination forms are available from the Students’ Union Office and Students’ Union website. Completed nomination forms must be returned to the Students’ Union Office on time. The deadline is very strict! It’s also an idea to get a few extra people to sign your nomination form to allow for any mistakes. Students can nominate as many candidates as they wish. Campaign Team  To run a good campaign, it is advisable that you get a team together to support you. This doesn’t have to be more than a few people but they will provide valuable support to you during the election week. Ask your friends to give you a few hours support and arrange times that suit them. Manifesto Your manifesto outlines your policies, plans and ideas for what you would do if elected. Talk to your friends and classmates about what they would like to see the Students’ Union do. Think about what your plans and how you would go about implementing them. You don’t need to think of all the details, but you shouldn’t promise free accommodation for every student without considering who would shoulder the cost! Above all, make sure your manifesto is as realistic as possible and relevant to students. Your manifesto should also include something about yourself and why you’re the best person for the position you’re seeking. Include a photo so people know who you are. It’s a good idea to use the same photo that you submit with your nomination for consistency. Speak to Students  Talking to people is the number one method for convincing students to vote for you. Posters, flyers and T-Shirts will only do so much. You need to get out and canvass voters. Most election candidates will tell you it’s the hardest part of an election, but it’s the most vital part. Take some time to think about what you want to say to voters. The most obvious question is why they should vote for you, so have an answer ready for them. Talking to students doesn’t mean shoving a flyer in their face: it means dialogue, asking questions and relating your policies and ideas to them. But don’t forget to balance the need to engage with the need to be efficient – you’ll need to reach a lot of people in a short space of time. This is where slogans can come in handy, especially if it jogs someone’s memory when they’re looking down a long list of candidates’ names when voting. Lecture shout outs are also a good idea for speaking to a lot of students, but you will need the lecturers’ permission first. Students want to know what you plan to change and how it will affect them. Simply saying “vote for me” isn’t enough. You need to tell them why. Showing them something you’re already doing (before you’ve even been elected) or something you have already done is a great way to show them you mean what you say. Running a Campaign Posters, leaflets and other promotional material Make sure your promotional material is eye-catching and gives a clear message to students. Ensure that there are no spelling or grammatical errors and that your name appears clearly! It sounds obvious, but factor in some time to get feedback (and free proof reading!) from your friends. T-Shirts are always very popular, especially during full-time elections. Be realistic when ordering T-Shirts. Count how many people you actually have on your campaign team and avoid overbuying. Remember that T-Shirts are only effective when they’re seen, so try to recycle them amongst your campaign team and friends who are actually on campus during election week. Social media and websites are also great promotional tools, but remember to stick within the rules. It’s very important to balance your promotional material. Nobody gets elected just because they have a cool poster. Don’t spend all your time designing a brilliant T-Shirt. It’s no use if nobody sees it. It’s also advisable to have consistency across your campaign material to make it identifiable. Follow the rules Schedule 1 of the Students’ Union Constitution outlines the rules governing publicity in Students’ Union elections. Read them and make sure your campaign team reads and understands them. Also, remember that the University Code of Conduct and general laws also apply! If it wasn’t allowed last week, it’s probably not allowed during election week. You’ll be held responsible for all elements of your campaign, so always err on the side of caution if you’re not sure about something. Don’t waste your time developing strategies and arguments to bend or break the rules. It sounds very simple, but remember that successful candidates win elections by convincing more people to vote for them than their opponents. Remember the Date Don’t forget to tell people then to vote. Despite the campus wide promotion, you’re bound to meet somebody after the election who’ll ask you when the election is on. Include the date of the election on your campaign materials and remind students that they’ll need NUI Galway ID to vote. Busting the Myths! Most students avail of, or benefit from, a Students’ Union service every day. Whether it’s having a pint in the College Bar or getting help appealing an exam result, the Students’ Union plays a bigger part in students’ lives than most realise. However, many students aren’t aware that the Students’ Union is a democratic organisation and that it’s run by ordinary students who are elected each year. Here are a few myths and misconceptions about running in an election and being a Students’ Union Officer. No you don’t! Many Students’ Union officers’ first involvement in the Students’ Union is their election. Full training and handover is provided to ensure you get up to speed before you start. It’s not about popularity! The campaign begins at 6:00pm on Sunday evening and the election takes place on Thursday. That’s more than enough time to knock on doors, go table to table in the canteen and College Bar and talk to thousands of students. Add in a few hours from your friends to hang posters and hand out flyers and you’ll be as well-known as any other candidate. Hard work trumps popularity in any election. Not true! The election regulations prohibit gifts and promotional items, so even if you want to spend money, you’ll find it difficult! Most candidates print posters and flyers, and with a little time spent contacting printers, you’ll be surprised what you can get for your money. The other common expense is campaign T-Shirts. As long as you don’t want Armani silk T-Shirts, an hour comparing prices from different companies will get you a good deal. Remote Vote is a system that allows students to vote online during normal polling hours. There’s only one requirement – students must register to use Remote Vote in the days leading up to the election. Once registered, students can vote online from anywhere during polling hours. Officers can definitely achieve considerable success within a year – whether it’s lobbying the University for improved services or organising major events, their influence can be felt throughout all aspects of University life. Of course there are some things that you may not fully achieve within your term, but that doesn’t mean they cease to exist! The only criterion to run in an election is that you’re a member of the Students’ Union at the time of the election. It doesn’t matter what year you’re in or if you’re an undergrad or postgrad student. Helpful hints •	Appoint a friend as your Campaign Manager. It’s useful to have somebody to handle logistics and arrange other volunteers when you’re canvassing. •	Do Lecture Shout Outs. This is the best way to talk to large groups of students, but remember to keep it short and always ask the lecturer’s permission. •	Order your campaign materials on time. Design and print takes time, so be sure to have your posters and manifestos ready to go at the start of the campaign. •	Check for mistakes. Get somebody to proof read everything. Reprinting posters because of simple typos can be a costly mistake. •	Manage your time. Try to keep your diary as clear as possible during election week. Rearrange any personal commitments and if you have a part-time job, try to arrange some time off. Be sure to get enough rest. Being tired and cranky doesn’t mix well with canvassing! •	Be gracious. Whether you win or lose, you’ll interact with a lot of people. Make sure you’re gracious at all times, especially to your supporters, but also to your opponents. •	Run your campaign, not your opponent’s. When you’re canvassing, give people reasons to vote for you, as opposed to reasons not to vote for your opponent. Stay focussed on getting votes for yourself. •	First Preference isn’t everything! The Students’ Union elections are conducted under the Single Transferable Vote Proportional Representation System so be sure to canvass students for second or third preferences if they’re already committed to supporting your opponent. Winning isn’t everything It’s important to remember that more people lose elections than win. Many former candidates that have not been elected have gone on to have strong careers. Think about what you get from running in an election: Not only does it look good on your CV, but you also get some great experience working to deadlines, managing a budget, being creative, managing volunteers/people, public speaking and running a campaign. Also, if it’s a specific set of principles that you care about, you get to give those issues a real platform by running in the election and the Students’ Union may pick up those issues after the campaigning is over. Polling hours are 10:00am-8:00pm. Polling stations and opening times of specific stations will be advertised by the Students’ Union in advance of the election. 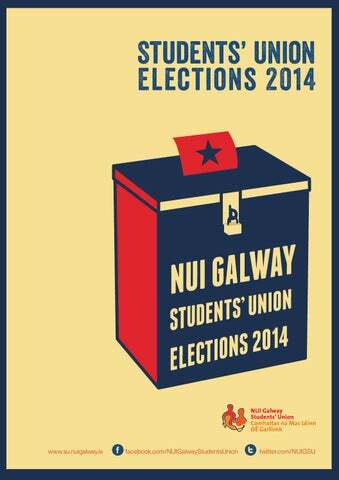 To vote at a polling station a student needs to present their NUI Galway ID. No other form of identification will suffice. Remote Vote Remote Vote is a facility to allow students to vote online. It’s particularly useful for students on satellite campuses and students on work placement, but it’s available to any student. The system is accessed via the Students’ Union website and is easy, secure and confidential. Students simply log in using their campus account. The only requirement is students must register to use Remote Vote before Election Day. If students do not register in advance, they will not be able to use the Remote Vote facility. Students’ Union elections are conducted under the Single Transferable Vote Proportional Representation System (Electoral Act of Ireland 1923, Amendment Act 1963). A guide to NUI Galway Students' Union elections.